The title Beaches was already taken. War is hell. Dunkirk was purgatory. In May of 1940, 400,000 Allied troops found themselves surrounded by Nazis on the beaches of Dunkirk, France. The enemy had halted its push in order for fighter pilots and bombers to pick off the stranded soldiers and take out the large battleships trying to ferry them the short distance to the heavenly reprieve of the English coast. So the soldiers waited in line, waited in fearful silence. Even if they made it onto a ship, attack was inevitable, as was futilely washing up back on shore. Hell above and behind them. Heaven just out of sight. In purgatory they wait. Christopher Nolan's Dunkirk provides a brutal and unrelenting look at the fateful World War II Battle of Dunkirk, though "Battle" vastly oversells a fight when one side is a sitting duck just praying for survival. For nearly two hours, Nolan drops viewers into the pure tension of those hoping to escape and never allows a moment of respite. Dunkirk offers an authentic cinematic reproduction of what it must feel like to be trapped in war. Prepare to experience the panic of gasping for air on a sinking ship, the buzz of bombers overhead, the feeling of being a sitting target. There is no fun in Dunkirk. There is no joy. There is no levity. There is only the looming cloud of death hanging like an apocalyptic fog just beyond the horizon. 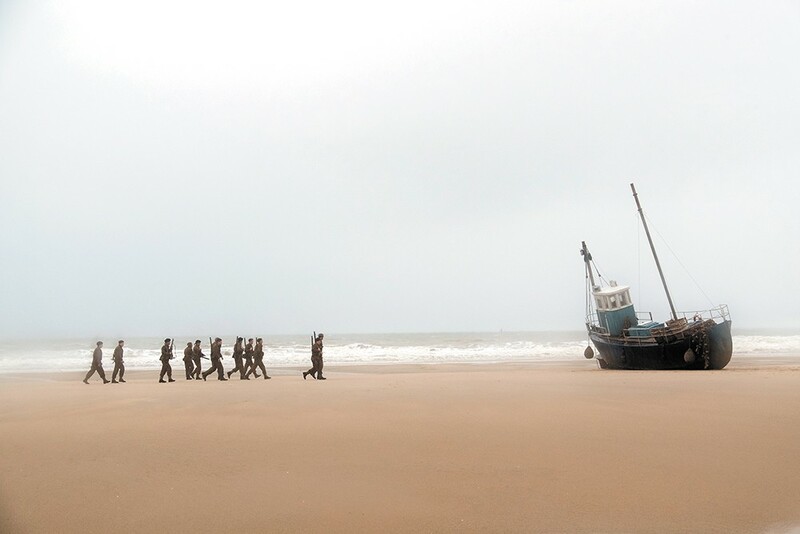 Nolan breaks the focus into three nonlinear story chunks that overlap: two young soldiers who meet by chance and go to extremely crafty measures to get off the beach; an Allied fighter pilot trio led by Farrier (Tom Hardy); and an English civilian boat captained by Mr. Dawson (Mark Rylance) that's deployed, along with others, to get troops out of Dunkirk. Because of the split narrative, it's often hard to determine exactly what's going on at any given moment (further exasperated by accent-thick dialogue that's often unclear in the audio mix), making a general yearning for survival the only clear through-line. On a technical level, Dunkirk is masterful filmmaking. From the moment that the beach is first revealed with thousands of soldiers filling the screen, there's an immediate sense of the majestic (and situationally horrifying) scope of the warfare. Employing actual vintage ships and aircraft, the practical effects on display throughout the film result in breathtaking cinematography (the aerial dogfights are especially stunning). Even details as simple as employing warm colors for the brief moments in England and a cold palette for everything in Dunkirk underscores the stark contrast of the English Channel's divide. Hans Zimmer's score does some heavy lifting as well, keeping everything on a tense edge for two hours in a world where the only other sounds are uneasy silence, gunfire and explosions. With all that said, there's something gravely lacking from Dunkirk — humanity. There's an air of stoic, manly detachment to everything. Every man on screen (and it's all men) feels like a disposable pawn on the chessboard. Perhaps that's Nolan's intent and message, but when the film reaches its emotional climax, things feel strangely cold because there's been no effort to make us connect with and care about the characters. Instead of empathizing with what's happening on screen, the only real feeling is one of relief that the experience is over. The viewer finally escapes purgatory.